Why Prepare Nylon Thread Before Beading? The preparation steps for nylon thread help prevent the thread from stretching after the beadwork is complete and to protect the thread from excessive wear both during and after stitching which could cause the beadwork to break prematurely. Another reason to prepare your thread is to prevent the thread from twisting together and knotting while you are stitching and to add a layer of conditioner that helps the thread hold on to the beads and improve tension, especially with looser stitches. The standard preparation steps for nylon thread are pre-stretching and adding a thread conditioner or wax coating. Both of these steps are quick and add less than a minute to your beading time - so they are well worth doing! 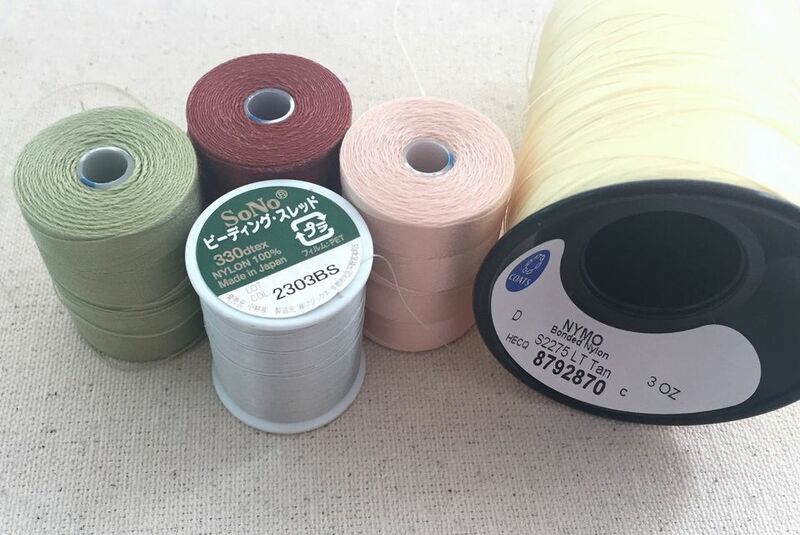 Nylon thread is one of the best choices for loom and off-loom beadweaving. It comes in a wide variety of colors and sizes and is widely available. It is made by multiple manufacturers. One downside to nylon beading thread is that it takes a few steps to prepare before you start stitching. Nymo thread is one of the more popular brands because it comes in a huge assortment of colors, is strong but also supple with a soft drape. It works especially well for fringe. Some other popular nylon beading threads are Silamide, KO thread and Super-Lon (or S-Lon) and C-Lon. Most threads, including synthetic fishing lines, have a little give to them. This is even more true of nylon and silk thread. Pre-stretching the thread prevents it from stretching after you have completed your beadwork and leaving gaps between beads. To start, cut a comfortable length of beading thread from your spool or bobbin. A comfortable length for most beaders is around four to five feet long. Often times, you will see the term an arm's span of thread. This is the amount of thread when you are holding one end of the thread in each hand with your arms outstretched from your sides. Using a longer piece of thread can be more time consuming because you have to keep pulling the extra through - and it can also lead to knotting, tangling and abrasive wear on the thread. Sharp embroidery scissors work well for cutting nylon thread. To stretch the thread, wrap one end of the thread around the index finger of your non-dominant hand, leaving a 2-3 inch tail. Stretch about twelve inches of thread at a time by gently pulling on the thread with your dominant hand. Once you have stretched a section, adjust your grip and move to the next section of thread. Continue until you have stretched the entire length. Make sure you don't pull too hard on thinner threads like sizes B and 0 which can snap or break easily. The next step to making your thread ready for beading is to condition it. Conditioning thread is optional​ but recommended for any thread that is not identified as being pre-conditioned. Conditioning thread helps smooth and flatten the thread fibers to cut down on friction on the thread, reducing wear and helping it glide through the beads more easily. It also makes the thread less likely to tangle. There are at least two types of thread conditioners available: Thread Heaven, which is a commercially prepared thread conditioner, or microcrystalline beeswax blends. Either one of these can be found in your local bead shop or from an online beading supply source. Beeswax is a natural and traditional thread conditioner. Many beaders like it. It is a bit sticky or gummy which can be a positive and a negative feature. On the good side, it can build up around the holes of sharp beads, protecting the thread from the sharp edges. But this same buildup can also make the beads look dirty. It can also feel sticky both when you are using it or in the finished project when the weather is warm. This can also be a plus since it increases the friction and can improve your tension when you are stitching. 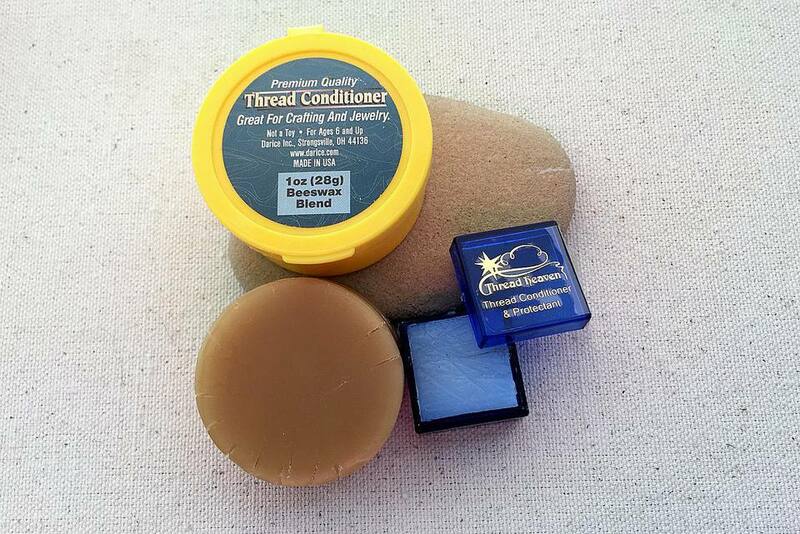 Thread Heaven is specifically designed as a thread conditioner for beadwork and other craft applications. In addition to making beading easier, thread heaven protects against UV rays, can be laundered without melting into the fabric, and uses static electricity to make the thread repel making it less likely to knot. Thread Heaven is readily available in bead stores and online retailers. Conditioning your thread is done the same way whether you are using beeswax or thread heaven conditioner. To condition your thread, press one end of the thread down gently into the conditioner. Run the entire length of the thread through the conditioner by holding it in place with your finger. After applying the thread conditioner, run the entire length of thread between your fingers to smooth and evenly distribute the conditioner. For wax, the heat from your hands will help melt the wax and bond it to the thread. With Thread Heaven, this will apply a static charge to the thread so the thread is not drawn to itself making it less likely to knot. Most times, a single application of thread conditioner is enough. However, if you feel like the thread conditioner is rubbing off during stitching, it can be re-applied to the ends at any time. A good time to re-apply thread conditioner is after you remove stitching mistakes. It can also help make re-threading the needle easier. Stretching and conditioning your thread will reduce tangles and make your thread easier to work with as you stitch. Once your thread is conditioned, you can thread your needle and begin beading!